He’s not one of the three – they are Athos, Porthos and Aramis. D’Artagnan is the fourth member who joins them, the one people remember most, the hero of the story. But hold that thought for a moment, while we back up on the history of persuasive writing. So far, so sound. But there is, of course, a fourth way, one that includes but transcends the other three. And the technique is both obvious and simple: combine all three, so that you appeal to the widest possible audience and present a balanced and compelling argument. Can that work? Can it be so simple? Well, there’s a large school of direct selling copywriters who expend a lot of time and effort testing everything. And they agree with this approach. A few years ago one of the masters of the long-form sales letter, Maria Velosa, wrote a book called Web Copy That Sells: The Revolutionary Formula for Creating Killer Copy That Grabs Their Attention and Compels Them to Buy. In it, she outlines many of the techniques used by professional direct sales copywriters. However, she also acknowledges that as the internet has developed along with, social media and the rest, the sales letter is becoming increasingly marginalised. One extremely powerful method of changing someone’s mind is by presenting multiple versions of the same concept. In my experience, as well as in most cases that I’ve observed, the optimum number of versions that has the highest likelihood of making an impact is three. three sales arguments presented in one digestible bite. So, to persuade someone of something (or indeed, to sell them something), you should employ the three traditional persuasive writing techniques combined and rolled together into one compelling sales message. How do you do this, in web sales copy, or a blog? In a letter, an essay, a report? Well, you need to do it quickly. Get to the point, get it into a few hundred words or less if you can. Appeal to their emotions: how will it make them feel? Establish credibility by using figures and statistics to back up your case. Present the logical reason for agreeing with the argument or buying the product. Then you can round it all off with another sentence or two. For a sales pitch, this might address any remaining resistance they may have. There you have it – persuasive writing in a nutshell. How to sell stuff on the Internet. 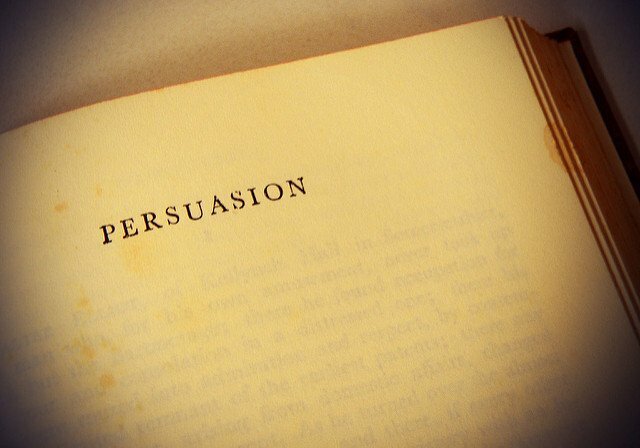 How to persuade people and win arguments in the world of social media. Persuasive writing, the fourth way. Or as I’m calling it, the “d’Artagnan manoeuvre”. Pic: Persuasion by reihayashi on Flickr.